SimiSodaPop | A Refreshment Of Bubbly Gossip! 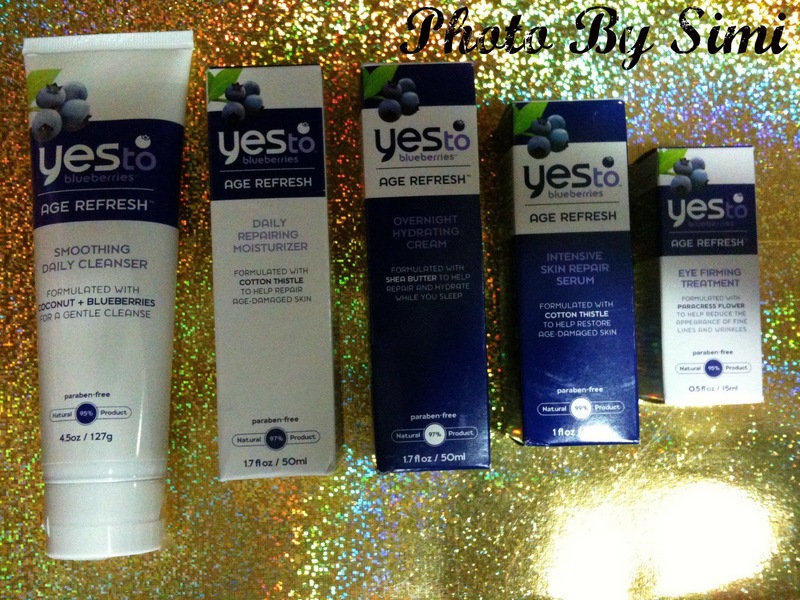 | Beauty, Fashion, Food and Entertainment: Yes To - Carrots & Blueberries - My Review on many of their products! Yes To - Carrots & Blueberries - My Review on many of their products! Now to introduce you to their brand they have 5 brands within the YesTo Company! I have been Lucky to get to try some items for the 2 lines "Yes To Carrots" & "Yes To Blueberries"
Rich Moisture Day Cream - Both the day & night cream are made from Dead Sea Materials and are Paraben free. I love both very much but i found myself to be using the day cream more. They leave your face feeling very soft and gorgeous! Repairing Night Cream - The Day & Night creams are very nice, used together every day it really makes a difference in your skin! Makeup Removing Cleanser - Now i can easily say this is like a high end expensive makeup removing cleanser but for way less cost! KEEPER FOR SURE! I LOVE IT! If your looking for a great makeup removing cleanser, you MUST try this one! Hydrating Body Lotion with SPF 30 - This body lotion is simply amazing, it keeps you super hydrated while having that SPF 30 to protect you from the harmful rays! The Texture is great and its a excellent body lotion. Exfoliating Cleanser - This item is Made from Dead Sea Minerals and is Paraben free. I have found this to be a great cleanser and it removes dead skin cells and leaves your face feeling very nourished & super fresh! Lip Glosses (All 6 of them) - These Lip Glosses are wonderful! They do just what they say! You know its hard to find a good Lip Gloss that doesn't dry out your lips, i hate when lip glosses do that, and thats not the case with these! They are wonderful when it come to everything, from moisturizing, making your lips shine & having great ingredients, just like the Lip Butters! If your a Lip Gloss Lover like me then you should check these babies out asap! Lip Tints (5 of them) - The Lip Tints are 95% Organic and Paraben & Carmine free! I love that this item does not have the icky ingredient Carmine!! Im so happy to find great lip tints with nice ingredients! My favorite Lip Tint would have to be "Natural Smile"
Very Moisturizing! I LOVE these! Pomegranate Lip Butter with SPF 15 - I love that this lip butter is with SPF! & its free of harsh ingredients! I love Pomegranate beauty products! This is a must have! It moisturizes your lips gorgeously! Lip Butter (In scent Melon) - Omg! I love this Lip Butter its Organic & all natural and it smells delicious and it makes your lips super soft and extra kissable! My favorite LipButter at the moment! I cannot wait to try more of their LipButters soon!!! Facial Towelettes - I have only tried a few kind of these "Facial Towelettes" and to be honest these are definitely one of the very best that i have tried! They leave your skin feeling fresh & clean & super soft & lovely, they also leave a little tingly feeling. I had a family member try out the Complete Line of Yes To Blueberries and She Has LOVED LOVED LOVED EVERY ITEM from the line! She said it has made her skin feel so soft and made it look super gorgeous! & She LOVES the scent of the Blueberries Line of products, it smells so lovely and the Smoothing Daily Cleanser she says it really woke up her skin and the scent was so nice! She REALLY loved this product especially! The Daily Repairing Moisturizer & The Overnight Hydrating Cream were so moisturizing and worked amazing on her! The Intensive Skin Repair Serum & The Eye Firming Treatment worked amazing as well! & I agree, her skin looks amazing and Yes To Blueberries is all to thank! She is now become addicted to your Blueberries line and has been spreading the word of your amazing products! Using all these products together after just a few try's she noticed a incredibly great difference! I really have nothing but GOOD AMAZING things to say about this brand! To be honest i did not know that i would fall in love with their products as much as i have! Its my new favorite brand at the moment and i love how they use healthy non harsh ingredients and its very hard to find a good beauty product that uses good ingredients but with The YES TO brand its a dream come true to find such a lovely brand! Yes To Brand uses lovely healthy ingredients & they are super affordable for everyone! I love that they are affordable so everyone can get a chance to try YESTO products! Affordable & Great ingredients, & products that work Simply GORGEOUS! ... you can't get better than that!